Another aspect of Fuller’s Spaceship Earth philosophy is the concept of ecology and utilitarian philosophy. 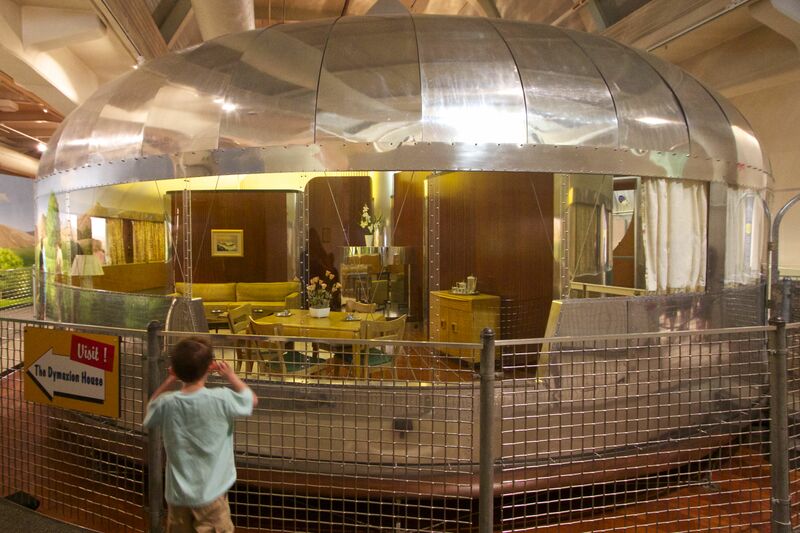 He had this concept in mind when he developed the Dymaxion House in the 1930’s. 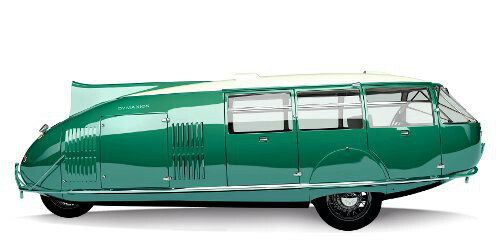 Dynamic, maximum, and ion were placed together to form the word Dymaxion. He named several inventions under this brand name such as a Dymaxion car, Dymaxion House, and other structures. The Dymaxion House could be put up in less than 24 hours. The roof was designed to utilize the dome effect which ventilated hot air out and forced cooler air downward creating natural air conditioning.4 The house also used packaging toilets which would package waste for composting. The bathroom was a one piece prefabricated unit with fogging shower heads to conserve water. The fogging showerhead used compressed air and water instead of exclusively water. Contributing to his Spaceship Earth philosophy was Buckminster Fuller’s development of polyhedron cuboctahedron map of the world which was a cutout in one of the most popular issues of Life Magazine.6 Users were allowed to visualize the Earth as one spaceship in the air age which would soon lead to the space age. Much of the mathematics and design principals used in this map would lead to Fuller’s development of the geodesic domes. The map and the domes exemplified his principles of the sum being greater than the parts and using engineering to maximize the end product with minimal materials. During the early 60’s, Fuller did a significant amount of travelling and lecturing on the impact of the growing population and how to satisfy its needs. This allowed him to experience different cultures and see things from a global perspective. 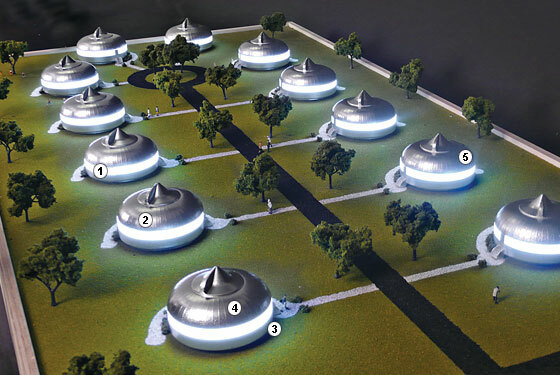 Writing in 1963, Fuller stated, “One third of the human family is now doomed to premature death due to causes arising directly from inadequate solution to the housing problem.”6 Buckminster Fuller, himself provided solutions this problem with his dymaxion homes and felt designers and scientist in the future would provide solutions to satisfying the needs of the increasing population with finite resources. Fuller taught “World Planning” while teaching at the Southern Illinois University. He encouraged students through a multidiscipline approach. “The design scientist would not be concerned exclusively with the seat of a tractor but [with] the whole concept of production and distribution of food”, Fuller wrote.8 He proposed several miniature Earths which mapped out areas of high population and encouraged thinking towards efficiently satisfying the needs of those areas. He also created a “World Game” where groups would tackle individual problems such as a lacking resource and discuss how to fulfill the needs of the population. These simulations led to thinking globally and enforcing the concept of earth as a Spaceship. It also enforced Fuller’s belief that “Malthusian philosophy is fallacious”9 and that human creativity and innovation could solve the world’s increasing population problem. Fuller’s popularizing a global view and emphasis on allocating resources, many of which are natural, helped to inspire the fledgling environmental movement in the 60’s. Some environmentalist felt that the same as Fuller that new technologies would allow the needs of the growing population to be satisfied while other environmentalist felt that the existing resources should be used more efficiently instead of hoping for new technologies to come along. Although Fuller’s geodesic domes and inventions aren’t as popular as they were during the Cold War, the concept of Spaceship Earth continue to impact the current age especially the global consciousness due largely to the internet and communication technology, using limited resources to satisfy an ever expanding population, and developing technology in harmony with nature. “101.01 Synergy means behavior of whole systems unpredicted by the behavior of their parts taken separately. 102.00 Synergy means behavior of integral, aggregate, whole systems unpredicted by behaviors of any of their components or subassemblies of their components taken separately from the whole. Like other Fuller concepts, Synergetics is interested in the production of the machine as a whole and not the individual parts. He wanted to maximize the output of the Spaceship Earth for the benefit of humanity. He explained this largely through geometry and geometric structures. Synergetics is wide ranging study utilizing expertise in various sciences and arts such as thermodynamics, chemistry, psychology, biochemistry, economics, philosophy and theology. Fuller outlined his philosophy in his 2 volume book Synergetics in collaboration with E. J. Applewhite. Looking at Fuller’s dome structures, smaller geometric shapes are used as building blocks for the main structure. For example, triangles within the greater shape of his geodesic domes. I think these concepts are easier to understand visually rather than reading a textual explanation. So, the following images and links show some of Fuller’s work using his principles of Synergetics. The following link is a compilation of YouTube video shorts showing Synergetics in action using various mediums by the Synergetics Collaborative (http://synergeticscollaborative.org/). A video summarizing the early part of Buckminster Fuller’s life and the development of his most famous dome, the Montreal Biosphere. Fuller, Buckminster (1963). Operating Manual for Spaceship Earth. (New York: E.P. Dutton & Co., 1963), 1.4. R. Buckminster Fuller, Nine Chains to the Moon, (Anchor Books  1971) pp. 252–59. Peder Anker, Frank Lloyd Wright, ‘Buckminster Fuller as Captain of Spaceship Earth’, Minerva, Volume 45, Issue 4 (December 2007), 417-434. Richard Buckminster Fuller, Ideas and Integrities, ed. by Robert Marks. (Englewood Cliffs: Prentice-Hall, 1963), 96. Anonymous, ‘R. Buckminster Fuller’s Dymaxian World’, Life, 1 March 1943, 40–55. Richard Buckminster Fuller, Ideas and Integrities, ed. by Robert Marks (Englewood Cliffs: Prentice-Hall, 1963), 187. Fuller, Operating Manual for Spaceship Earth, (New York: E.P. Dutton & Co. 1963). 44, 133. Richard Buckminster Fuller, Utopia or Oblivion (New York: Overlook, 1969), 293. Edwin Schlossberg quoted in Richard Buckminster Fuller et al., World Game Report (New York: New York Studio School, 1969), Note 37, 1. WNET Article”. Thirteen.org. Retrieved 2012-01-22. Moore, Gordon E. (1965). “Cramming more components onto integrated circuits”. Electronics Magazine. p. 4. Retrieved 2006-11-11. Kaku, Michio. “Parallel universes, the Matrix, and superintelligence”. Kurzweil. Retrieved 2011-08-22. Ray Kurzweil (2001-05-01). “The Law of Accelerating Returns”. KurzweilAI.net. Retrieved 2006-06-24. Fuller, Buckminster. Synergetics: Explorations in the Geometry of Thinking (Macmillan Publishing Co. Inc. 1975, 1979). 100.00 Synergy, 900.00 Modelability. February 6, 2019 in CROSSROADS: Evolution. Devolution or Revolution, DEEP GREEN: The Commoditization of Planet Eath, RETURN TO EDEN: Resilient & Resourseful Living, The Way of the Rainbow Warrior.